NBA Star Set For WWE Career After Basketball Retirement? New York Knicks center Enes Kanter eyeing HUGE career change. New York Knicks center Enes Kanter could be set to swap real sports for sports entertainment when he steps away from the NBA. Speaking to The Atlantic, the 26-year-old claims he became a huge wrestling fan when he was in college, has followed the sport ever since, and would already be training for the sport if not for his NBA contract. "The Knicks don't want me in the ring," he said. "I asked them, and they said I'm not allowed to be in the ring." Understandably, the struggling franchise don't want their leading rebounder hurt while bumping for an arm drag. This hasn't hampered Kanter's enthusiasm, however, who "definitely wants to do [wrestling]" when his professional situation allows it. 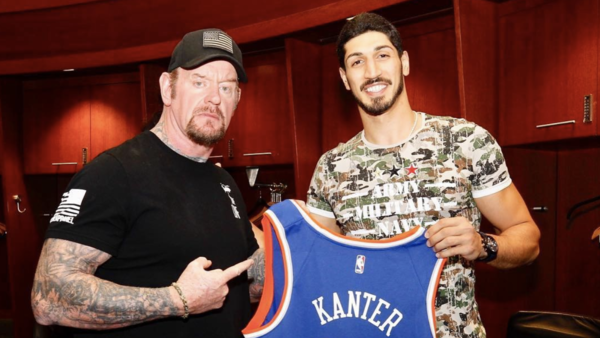 Kanter lists The Undertaker among his heroes, is currently dating Raw Superstar Dana Brooke, and is good friends with Paul Heyman, who claims he'd hope the Turk would aspire to headline WrestleMania someday. At 6'11" and 250lbs, Kanter already has the size required for WWE, but is perhaps best known for his brazen personality. His fiery Twitter activity and recent feud with LeBron James have seen him become one of the league's biggest villains, boding well for his future life as a WWE star.